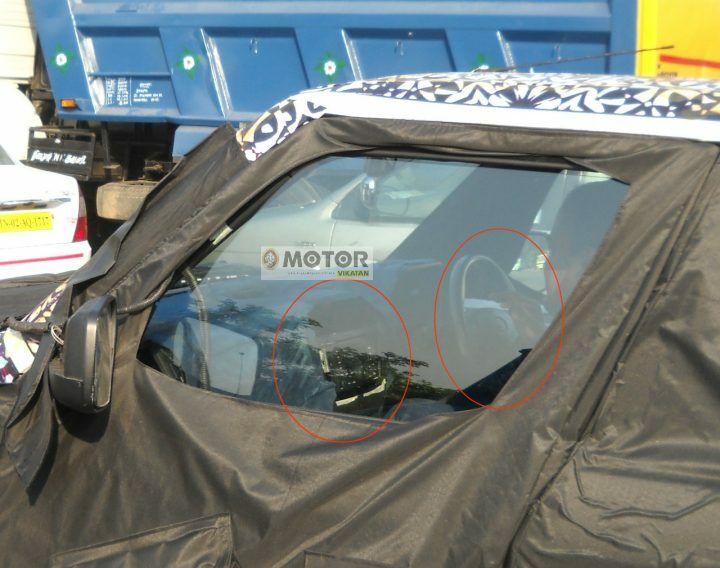 The shorter variant of the upcoming Mahindra Bolero has been spied testing again, and this time a part of the interiors can be seen. Though a long way from production ready, changes made to the interior are pretty evident. The steering wheel design is all new, the centre console design has been revised though overall the dashboard layout is the same. 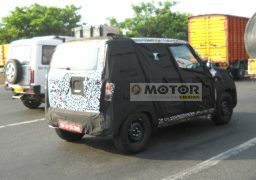 As we had mentioned before, this test mule is of the sub 4-metre variant of the upcoming Bolero, it will offer the bare-bones no-nonsense capability of the Bolero in a cheaper package, which is sure to make the brand even more popular in India. It will be powered by the 1.5-litre mHawk engine that powers the Quanto and thus the mini-SUV will comply with small car norms in India. 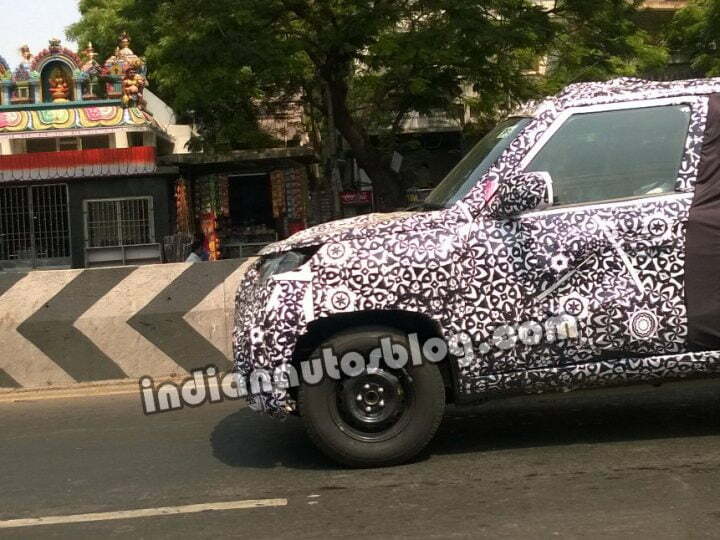 A Mahindra SUV in full camouflage was spotted doing test runs on the streets of Chennai. At first it was thought to be another Scorpio facelift which is frequently spotted around the Mahindra Research Valley but closer inspection would show that this is in fact the lesser glamorous SUV from the Indian automobile makers, the Mahindra Bolero (code- U301) being tested for a 2015-2016 launch. Price of current gen Mahindra Bolero BS4 variants starts at Rs. 6.44 Lakh, the new one should not cost much more. 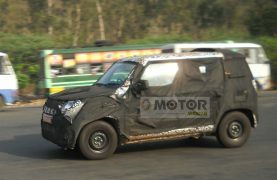 In fact Mahindra is developing a sub 4-metre variant of the Bolero which is what you see in the spy shots here, this variant could cost much less, maybe closer to Rs. 5 Lakh. These features of the test mule are conclusive enough to rule it out from being the Scorpio facelift. The 13 year old Bolero has served Mahindra well, with very few upgrades made to it in all this time. It is indeed time that Mahindra launches a facelift or next generation Bolero as evident from the spy-shots. With the success that the XUV500 is seeing, engineers at Mahindra are clearly keen on passing its styling cues to rest of the stables as well, which from our point of view may not exactly set our pulses racing because the Bolero could use its own signature styling that its always had. Though its speculative as to what upgrades might come on the new Bolero, reports suggest that the facelift could be a sub-4m vehicle (short overhangs and a very compact rear quarter glass is suggesting the same) built on a new hydroformed ladder frame chassis. Expected powertrain include the Quanto’s 1.5 litre 3-cylinder diesel engine coupled to a 5-speed gearbox and possible AMT (Automated Manual Transmission) as well. Presently the Bolero is powered by a 2.5-litre 4-cylinder engine delivers 63 BHP @ 3,200 rpm and 180 Nm @ 1,440 rpm. The Bolero as on date is available in two body lengths the ‘Bolero’ and the ‘Bolero Plus’ and the same variant plan could support the successor, with a four-cylinder engine used on the higher capacity variant. The compact version could be launched before the other variants. What are your thoughts on Mahindra upgrading the Bolero, share with us through the comment section below.